Do you want to catch lots of fish? Gill nets WORK! Flag style gill nets are very effective in catching fish. Imagine a large spider web hanging from the top of the water with the sides and bottom not attached to anything. The water must be still. A fish swims into the gill net. The net pushes forward and clings to the sides of the fish with almost no resistance. When the fish finally feels resistance, the gill net is clinging to both sides, the fish turns and effectively folds itself into the net with no real harm to it. Contrary to many misconceptions, gill nets cannot be used as seines. But then, they're not as labor intensive as seines are either. A gill net can easily be fished by one person, but can easily catch more fish than that person can eat. 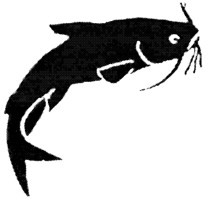 These gill nets are very popular in some parts of the country for catching yellow catfish also known as yellow cat, mud cat, shovelhead cat, johnnie cat, goujon, appaluchion, opelousas or flathead cat. Tie-down gill nets are used in the Southern States for carp, gar fish, garfish, buffalo or Buffalo Fish and other fish that are not usually easy to catch with hook and line. Salmon, trout, lake trout and other fish are caught in the Northwestern States with tie-down gill nets. Gill nets are also very popular in the New England and Virginia area for catching menhadden, bunker or shad for bait for large predator fish such as tuna or yellow catfish. Tie down gill nets are very popular along the James River. It is advisable to check with your local game laws because there are often limitations on the use of gill nets and other fishing devices. By the way, we measure one of the four sides of the square mesh when we describe the size of the mesh (that is from knot to knot). If you want to convert to stretched mesh sizes - multiply by 2. In other words, 2 inch square mesh is also described as 4 inch stretched mesh. We basically have two types of nets and each come in multi-filament (nylon) or monofilament. Nylon Flag Style Gill Nets A very effective net in still water! Monofilament Flag Style Gill Nets To be used in clear, still water - less tangles! Nylon Tie Down Gill Nets Most effective net for flowing water. Mono-filament Tie Down Gill Nets For clear, flowing water - less tangles. Nylon Tie Down H-D Gar Nets Especially for gar fish,large buffalo fish or carp. Decorative NettingGreat for establishing a marine/outdoors theme! Flag style gill nets have a top line and no bottom line. This makes the flag style gill net the simplest form of gill type nets but it is also the most effective. BUT it can only be used in still water and the top line must be attached to something firm on each end so the net is stretched across the body of water. Really great for ponds or lakes! Nylon or multifilament line - since it is limp - is the most effective line for nets in catching fish. After a time the twine takes on the color of the suspended clays and particles in the water and becomes effectively invisible. It tangles very easily around the fish and it becomes very difficult for the fish to escape. Because it is limp, it can tangle with weeds and twigs and it will take a hands on removal of many of those items even after diligent shaking. Even so, many fishermen insist upon nylon gill nets. Extra heavy duty flag style gill net with #15 twine for garfish and buffalo fish in lakes and still water. Flag style gill nets have a top line and no bottom line. This makes the flag style gill net the simplest form of gill type nets but it is also the most effective. BUT it can only be used in still water and the top line must be attached on each end so the net is stretched across the body of water. Really great for ponds or lakes! Mono-filament line is springy and clear. It is very hard to see in water but since it is springy it sometimes doesn't stick to the side of the fish well and they may escape if not thoroughly entangled. This springiness can become a benefit though, if the water is heavy with debris (twigs, weeds, etc) because of the springiness or stiffness of mono-filament, the fisherman can shake the net and much of the debris may shake out. Ya get some and ya give some! Tie down gill nets are designed to be fished in flowing water. They are designed with a float line at the top and a lead line at the bottom. (We use a foam-filled float line rather than a line with cork or plastic floats because the floats tangle in the net so easily. The floatline or sinker line won't do that. Happy Fishing!) There are strings running from the float line down to the lead line at the bottom. These strings on the following 8' nets are 8' long but the netting hanging from the float line is 10' long. This gives the netting slack to wrap up any fish that hits it. Not quite as effective in catching fish as the flag style gill nets but the least expensive way to use a gill net in flowing water.Much less expensive as a trammel net and just as effective. Nylon or multifilament line - since it is limp- is the most effective line for gill nets in catching fish. After a time the twine takes on the color of the suspended clays and particles in the water and becomes effectively invisible. It tangles very easily around the fish and it becomes very dificult for the fish to escape. Because it is limp, it can tangle with weeds and twigs and it will take a hands on removal of many of those items even after diligent shaking. Even so, many fishermen insist upon nylon gill nets. Just the net for catching shad or other baitfish. Leaded gill nets are similar to tie down gill nets except they don't have the tie down. They still have the leaded bottom line and the foam float line but the net can reach to its full extent. It means that there is no slack in the net to let the smaller fish roll themselves up as easily. Still a very effective gill net and has no tie downs to tangle. Just the net for catching shad, mullet or other baitfish. Popular in Florida! Mono-filament line is springy and clear. It is very hard to see in water but since it is springy it sometimes doesn't stick to the side of the fish well and they may escape if not thoroughly entangled. This springiness can become a benefit though, if the water is heavy with debris (twigs, weeds, etc) because of the springiness or stiffness of mono-filament, the fisherman can shake the net and much of the debris may shake out. These are great for catching bait! Great for catching bait such as bunker, ect. Complies with 200 sq. ft. rule for some areas. Complies with 200 sq. ft. rule for some areas. 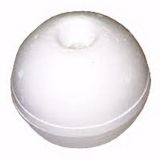 Can be used for catching bait such as bunker, pogeys, Menhadden and others. Can be used for catching bait such as bunker, pogeys, Menhadden and others. Can be used for crab traps. 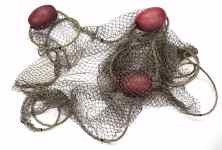 Leaded H-D Gill Nets are designed to be fished in flowing water. They are designed with a float line at the top and a lead line at the bottom. The netting is made up of #15 twisted nylon which is heavy enough for most large freshwater fish and a good number of saltwater fish. (Large fish should be boated with a gaff or dipnet to eliminate damage to the gillnet.) Not quite as effective in catching fish as the flag style gill nets but the least expensive way to use a net in flowing water. Ideal for Gar, Buffalo fish & Large Carp - any larger fish with hard bony gill covers. This is heavy line in this net. It will only catch large fish well! Ideal for Gar, Buffalo fish & Large Carp - any larger fish with with hard bony gill covers. This is the 9' Leaded gill above with a 7' tie from the floats to the sinker line. Ideal for Gar, Buffalo fish & Large Carp - any larger fish with with hard bony gill covers. This is an 8' Leaded gill with a 6' tie from the floats to the sinker line. Ideal for Gar, Buffalo fish & Large Carp - any larger fish with with hard bony gill covers. Ideal for Gar, Buffalo fish & Large Carp - any larger fish with hard bony gill covers. For your home or business. Very attractive light brown (almost a khaki color) which lends itself to most color schemes. Great for the home or business! Measures 3' tall and 6' long. Makes a great wall decoration! 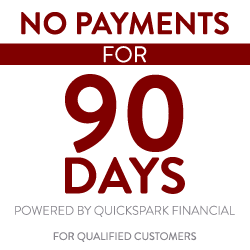 Great for the home or business! Measures 5' tall and 10' long. Makes a great wall decoration! Great tool for your gill net. Sometimes the gill net gets wrapped real tight around the fish. This is the perfect tool to get under the line so you can pull the fish free.